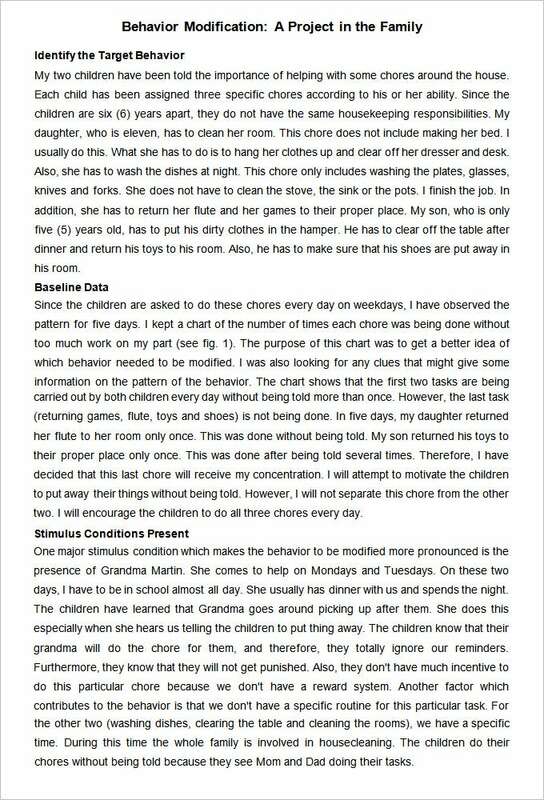 Behavior Modification Plan Template – 5+ Word, PDF Format Download! With the help of guides and these versatile, free/paid templates, you can make your task a lot simpler just by clicking on that download button. A behavior management plan template incorporates several aspects of a child’s growth, and the appropriate treats or punishments. A behavior modification plan example should ideally help you integrate form a response plan for every situation. Part of any behavior improvement plan should be devoted to assessing the child and formulate an action Plan Template to help them better. The uniqueness of this template lies in the fact that it can be applied to an entire family. An example has been given in this template which explains how to use the template effectively. This template named Behavior Modification Family Plan looks catchy despite its serious demeanor. Heads like ‘baseline data’ and ‘stimulus conditions present’ set it apart from many like it in the fray. 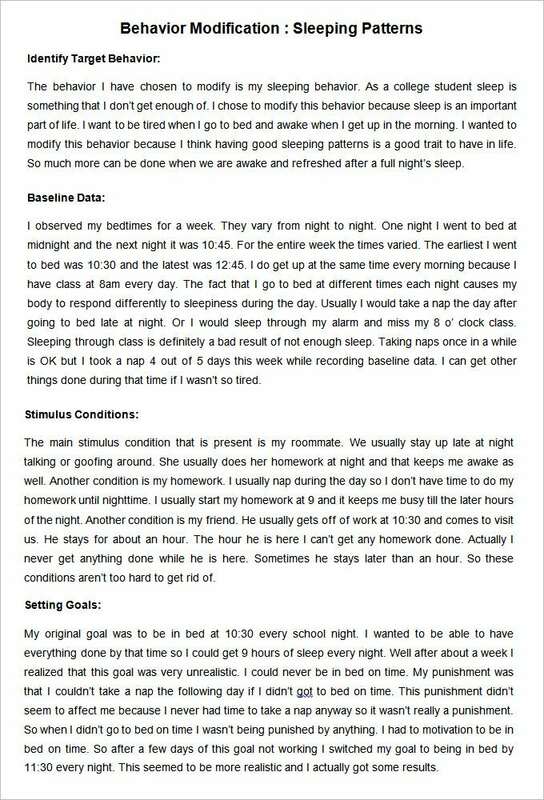 This template has highlighted a patient’s problems with respect to his sleeping patterns. But you can follow it to develop your own behavior modification plan. Besides, the document portrays the content in quite a lucid manner. This Behavior Modification Plan for Sleeping Patterns is absolutely free of cost and has no hidden charges. Just download it and reap amazing benefits. This document mentions in detail what a Behavior Intervention Plan is and how it can be used to bring about changes in a person’s faulty behavior. The document looks a little content heavy but everything entailed is of immense value to the user. For the ease of reading, the content has been arranged point wise. The most important details in this template have been put inside two gray boxes. The boxes are without sharp borders, which makes the template look orderly. There is also an illustration of a pencil at the top which offers the template an academic touch. 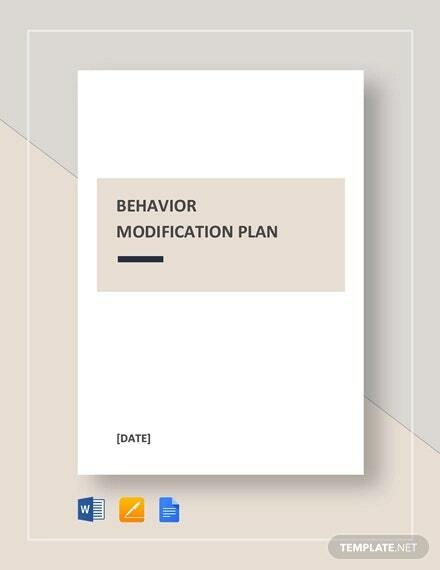 Download this Behavior-Modification-Plan-Template and make behavior modification a fun filled challenge. > What a behavior modification plan is and how templates help? Behavior modification is a psychological concept, effectively used in the field of clinical psychology. It is an approach that is based on the concept of operant conditioning and is used to bring about behavioral changes in individuals with behavioral problems. This is a treatment approach mostly exercised on children with issues in their behavior. When behavioral problems remain unaddressed for a long time, they become unsolvable. And therefore, it is important to get them fixed early on. If you are a clinical psychologist who has difficulty developing effective behavior modification plans, a behavior modification plan template will be of great help to you. Any behavior plan sample can include things like student information, progress report from day to day, and negative aspects of the plan. These premium templates are top-of-the-class, because they give you the flexibility to choose and customize according to your unique needs rather than straight jacketing your kid with all others behavior modification techniques – keeping your best interests at heart. The entire internet space is flooded with scores of Behavior-Modification-Plan-Templates. All you have to do is pick the ones that suit your requirements. The collection is varied as you have paid as well as free options at your disposal. Even the quality of print these templates are able to offer is high. So, what makes you wait? Adopt any of these templates and make formulating behavior modification plans a piece of cake.